Over the years pools have become one of the most desired high-end toys to have in your backyard. They work on so many levels - as beautiful garden features, relaxation sanctuaries, entertainment, social occasions, and dare it, fitness. Plus, there’s the value they can add to your property. A well designed pool can increase the net worth of your property. With the right features a pool can increase the desirability factor tenfold. If you want something cheap and cheerful you can order a pre-made above ground pool on Amazon. If you want something longer lasting which integrates with your property, you need to call in a construction company, ideally someone who specializes in pool construction. If you have truck loads of cash call in the architects first to design your masterpiece. Traditionally pools were square but now you can get all sorts and shapes, with intricate surrounds and features. The world is your oyster. Here's some amazing designs to wet your appetite. For the connoisseur with bucket loads of cash, and space, does something like this take your fancy? Seamlessly integrating this pool with the spacious home was the objective. Designed to flow from an outdoor bathroom, a large outdoor bathtub and shower positioned on a timber boardwalk, create one of the largest en suites on the planet. This is one example where the classic rectangular pool doesn’t quantify as boring. This Hollywoodesque hilltop box certainly has a 1970’s yet modern day feel to it which translates across the cool minimal lines and 90 degree edges of the second storey cubes straight into the pool. Simple, yet elegant. And just look at that decking strip. The homogenization of pool and home as one consolidated unit, and not merely an extension, certainly owes a nod to famous California architecture luminaries Frank Lloyd Wright or Jerrold Lomax. 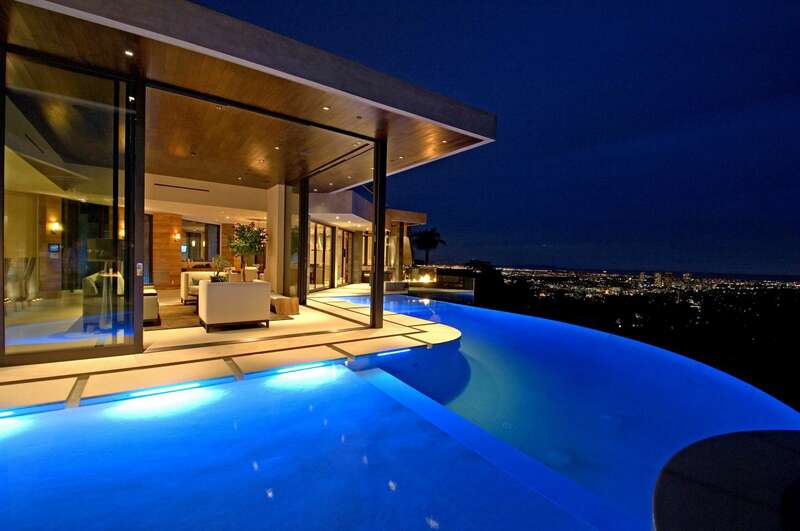 Known as the Bluejay Residence, this mammoth 6000sq ft Los Angeles lavish home offers cityscape jetliner views of L.A. The backyard is integrated into the home and with a pool like that (obviously reflective of the residences name) why wouldn't you want it to. According to the architects Dean Larkin Design, great architecture transcends itself, its occupants and its environment. Does this house do this? Does the pool add much to the building? Just looking at it poised over that famous skyline, undoubtedly it does all this and more. Trying to think of something i don't like about this home - yes it's not mine. And are the people really happy that live here (if they do)...? If money is no object what do you do to your crib? You design an inconceivable object, albeit an extraordinary pool with an obscene scope, that runs underneath the mansion. Oh and it's ideally situated in San Diego County's North County rocky region. Whether or not you think something on this scope is beautiful or far too indulgent, there is an amazing vantage point where the pool seemingly cascades across the mountain tops, perfectly illustrated by this night time scope. Situated in bustling Brisbane, this cool pool room offers a retreat from the subtropical searing heat of Queensland where humidity runs high during the summer. It also allows it's inhabitants escape from torrential rain storms and to enjoy the fruits of modern life outdoors. This is also a very functional space, which is why it works so well. You don't always want to use the pool but just being outdoors out of the heat beside rustling water is so relaxing. Would you want to watch TV indoors with over 40º heat in the summer? Neither would we. Should we go to the beach today or just admire the view? There's showing off, then there's showing off the view which this unique infinity pool design by Justin Long does in a remarkable way. Incorporating decking with a lounging bed is a perfect principle for this waterfront property that incorporates an unmatched birds eye view with opulent space. If the undulating ripples in the pool don't calm the senses, the lush waves and untamed freshness from the wild ocean will reinvigorate the senses. does it match your cutlery set? The German's are at it again with this superb stainless steel elevated pool with matching water feature and cool subtle lighting that really sets it off. Engineered to perfection the polished steel beautifully encloses the shimmering pool. Designed by Berndorf Bäderbau, stainless steel is extremely low maintenance and weather resistant. Think long life, cost effective, functional and minimal service costs, like most German engineering. But that's the boring stuff... does it look stunning? Yep! This $3 million monster in Houston is the largest residential pool in the world which holds over 600, 000 gallons of water. You can find this pool in Mike Mobley's backyard and all his friends and the local community are regularly invited. It has beach huts, a monster slide (7 x times bigger than average), but the main attraction is the extremely fast 500ft lazy river. There is a huge rope swing hanging from a gumnut tree beside an Indira Joneseque rock waterfall. This is more like a water park than a backyard retreat, plus all the locals are extremely welcome thanks to kindhearted owner Mike. If you can't get to the Caribbean as often as you wish, why not create your own Island lagoon on your property? Add a touch of the tropics to your backyard. This secret pool is situated on a Florida barrier island, and mixes natural limestone with lush vegetation. Location is everything they tell you so of course this pool has a walk in beach area combined with a raised spa, multiple waterfalls & cool lighting. Get back to nature with this eco-friendly natural pool that prefers to use natural filtration via rocks and plants instead of chemicals to filter out bacteria. This would fit perfectly with a rugged landscape and would suit health conscious biological bathers who want their pool to blend seamlessly with nature. The emphasis here is on integration. Biological pools also require less maintenance than traditional pools. They are set in a natural ecosystem that consists of a bathing/swim area and a filtration are, courtesy of vegetation and stones that filter out dirt and pollutants. No chemicals are required to sanitize the pool. You will need a filter and a pool heater is also a handy extra. You will need to manicure plants and vegetation occasionally, to stop them getting out of hand, and also clean the pool floor once in a while. Hassle free natural living. Encapsulating the natural elements of earth, wind and fire, fueled the creative process behind this modern pool. Taking home comforts to a new level this pool features a fire table in a deluxe lounging area, replete with plush rattan seating, cantilever umbrellas, which also surround the pool. Sometimes with pools you just gotta let nature take shape. Just showing one element of this pool, a splendidly layered natural stone waterfall set off with thick palm trees intertwines nature with man-made achievements. The water seamless cascades over several layers of rock and creates undulating ripples in the pool below.